More islands should be able to host the Island Games, even if it means putting on smaller events, according to the vice-chairman of the movement. James Johnston says the event must not become so big that only a few islands are able to be hosts. "It's important that we get away from the fact that we're looking for bigger and better games," said Johnston. "It's more important that we ensure that our member islands are able to host the games," he told BBC Guernsey. Johnston was a member of a delegation from the International Island Games Association who have recently been in Guernsey as part of the island's bid to host the 2021 games. The event has expanded in recent years, with last summer's games seeing over 2,700 athletes from 24 islands compete in Jersey, an event which cost almost £2m. Gotland will host the 2017 Island Games, followed by Gibraltar in 2019, after the British Overseas Territory stepped in following Menorca's decision to withdraw from staging the event. 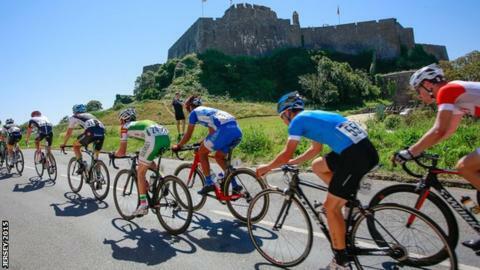 Gibraltar will host a smaller games with football, cycling and volleyball among the sports to miss out and, like Shetland in 2005, will bring in cruise ships to house competitors as there are not enough hotel beds. "It's about trying to make sure that something's right for their own island rather than continually grow, otherwise we'll end up back with just a few islands that are able to host the games and we won't get the diversity of islands," added Johnston. "In Gibraltar there's no football and there's no volleyball, and when that was announced it caused some angst. "But the reality is we do have a list of 18 sports and it's important that the potential host island does what's right for that island, because that's where the investment's going into."